Inspired by the exclusive Yaris GRMN performance hatchback, the new Yaris GR SPORT is set to bring more sports driving pleasure to Toyota’s supermini range. Now on sale, the new model will be the first GR SPORT specification car launched in Ireland and throughout Europe. The introduction of the GR SPORT grade is a further example of how the international motorsports success of TOYOTA GAZOO Racing is feeding directly into an exciting new generation of GR-branded road-going cars. Toyota’s return to the World Rally Championship in 2017 led to the development of the performance-focused Yaris GRMN, which won high critical acclaim and was a sell-out success with all 400 examples snapped up by customers before the car reached the showroom. 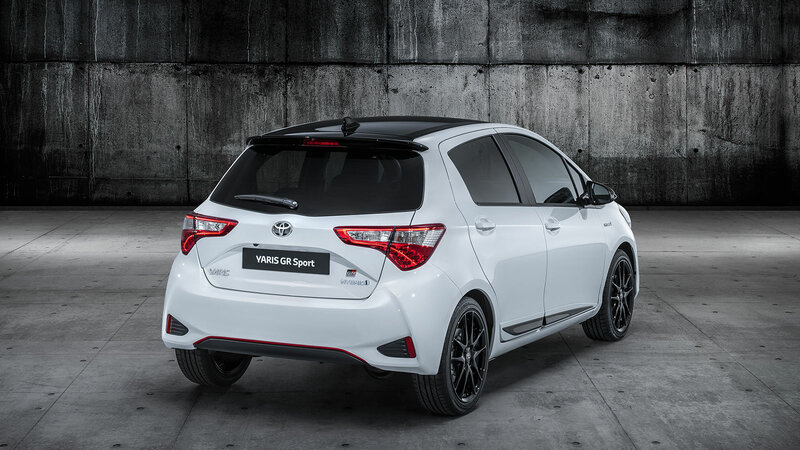 The new GR SPORT takes the GAZOO Racing sporting influence to the heart of the Yaris range, delivering genuine fun-to-drive performance and sports styling. The car has a sporting stance, with ground clearance reduced by 11 mm compared to the standard Yaris, and with the gap between wheel and body brought down by 18 mm. The black 17-inch cast alloy wheels are exclusive to the GR SPORT, but are fitted with the same Bridgestone Potenza RE50 205/45R17 tyres as the GRMN model. The GR SPORT is a five-door and will be available exclusively with the Yaris’ standard 1.5-litre self-charging hybrid powertrain. The exterior styling follows that of the Yaris GRMN, including a black bi-tone roof with shark fin antenna and rear spoiler. There are piano black door mouldings, a black honeycomb grille, black door mirror housings and black front fog light surrounds. The headlights are unique to the GR SPORT, with black interior detailing. Dark-tinted rear privacy glass is also fitted as standard, together with GR badging. Red decals can be added to the front lip and the top line of the lower rear bumper to generate extra sporty visual appeal. In the cabin the GR influence is highly visible, with GR-branded sports front seats, upholstered in black Ultrasuede with contrast white stitching and white inserts. When the driver presses the start button, the multi-information TFT display comes to life with the GR logo, setting the tone for a rewarding drive in store. To help make the most of the car’s handling potential, the GR SPORT is equipped with the same small-diameter three-spoke steering wheel as the GT86 coupe. The sporting feel of the interior is enhanced by a black headlining and satin chrome trim for the gear shift lever and the air vent and door-mounted audio speaker surrounds. As a finishing touch, black GR-branded carpet mats with silver edging are fitted. Prices start from €23,700 or from €192 per month. For more information on pricing, specifications and grade levels, build your Yaris GR Sport below or visit your local Toyota dealer.